From Earth Clinic, the top choice for best natural decongestant is a recipe called “Jean's Famous Tomato Tea“. This recipe has received rave reviews for nasal congestion. as well as fighting sinus infection and sore throats. Consume this mix warm, every 6 to 8 hours. To inhale ACV, boil some ACV on the stove and breathe the fumes, or mix a drop or two in your saline nose spray. (Make sure not to overdo it, and keep things clean.) Read more about ACV and sinus congestion at Earth Clinic. A hot shower full of steam is a godsend when you’re dealing with nasal congestion, but you can sneak in a little relief in a much smaller area by using a bowl of boiling water tented with a towel over your head. Take a large bowl and add fresh or dried herbs such as eucalyptus, rosemary, peppermint or New England Aster. (Use a few drops of high quality essential oils if you prefer, or you can skip herbs altogether, but in my experience they do help.) Pour in boiling hot water. Lean over bowl and inhale the steam as best you can, tenting your head with a towel to trap the vapors. You can also use a personal steamer. Hot tea with lemon and honey has been a congestion fighting favorite of mine for years. Momma always stocked Lipton tea bags, but now I use bulk teas or herbal tea blends, such as tulsi (holy basil). Lemon provides extra vitamin C, and honey is naturally antibacterial, so do include them in your brew. To make an herbal tea, cover 2 teaspoons dried leaves or 1/4 cup fresh leaves with 1 cup boiling water, steep for five to ten minutes, then strain and enjoy. (For ginger root, use about a 1/2 inch piece of fresh root, or 1/2 tsp-1 tsp of dried root bits.) I like to steep in a tea pot or cover my tea mug to keep the vapors from escaping. If you have a really stubborn cough or cold, check out the recipes for Cough-Be-Gone and Sore Throat Syrup and Cold and Flu Tea. Back in college, a group of us went out to a Chinese restaurant. One of the guys had a bit of a head cold. Another guy dared him to sniff some Chinese Hot mustard. Being a young and foolish male, he tried it. After yelping in pain, he did find that his congestion was gone. I'd recommend simply adding spices to your food. It's also good to drink lots of water or other non-caffeinated beverages to help you stay hydrated and loosen phlegm. You can see why a paleo/primal diet may be helpful for those suffering with chronic congestion. Simply take a small amount of coconut oil or palm shortening (about an ounce) and add a good quality essential oil such as eucalyptus oil, mint or wintergreen. Use 7-10 drops and mix well. Never use essential oil directly on your skin – always use a carrier oil. Spread on the chest area or dab under the nose. Note: Eucalyptus and Rosemary essential oils should not be used for children under 10. Do not use mint essential oils for children under 6. Pine, spruce, fir and cypress are safer alternatives for children over 2, but with the younger set I prefer to utilize the other options on the list. (More info at Food Renegade.) Many essential oils are also problematic for pets, so it's best to avoid random exposure for them, too. Oil pulling also helps to loosen mild congestion. Simply take a spoonful of good quality oil, such as coconut or sesame, place it in your mouth, and squish for 10-15 minutes. This can be a little tricky if you're having difficulty breathing, so it's not my first choice for severe congestion, but it will help loosen mild congestion. See Oil Pulling – Fact Versus Fiction for more information. Again, this is best for mild congestion. Warm salt water soothes throat tissue irritated by nasal drainage, and the heat, moisture and gargling action helps to move and shift booger build up. Nasal irrigation with a neti pot or nasal spray may help to flush irritants (and boogers) from the sinuses. Some people swear by it, others can't stand it. For those with a deviated septum, it doesn't tend to work well. The fluid goes in but doesn't come back out very well. If you chose to use a neti pot, make sure to use sterile or distilled water. In rare cases, people have died from Naegleria fowleri (brain eating amoebas) in their neti pot water. The video below demonstrates how to use a neti pot. Which Nasal Congestion Remedy Works Best for You? Did I miss any natural nasal congestion remedies? Share what works for you. This post is intended for general information only. Please see a medical professional if pain is severe or sinus problems last for an extended time. 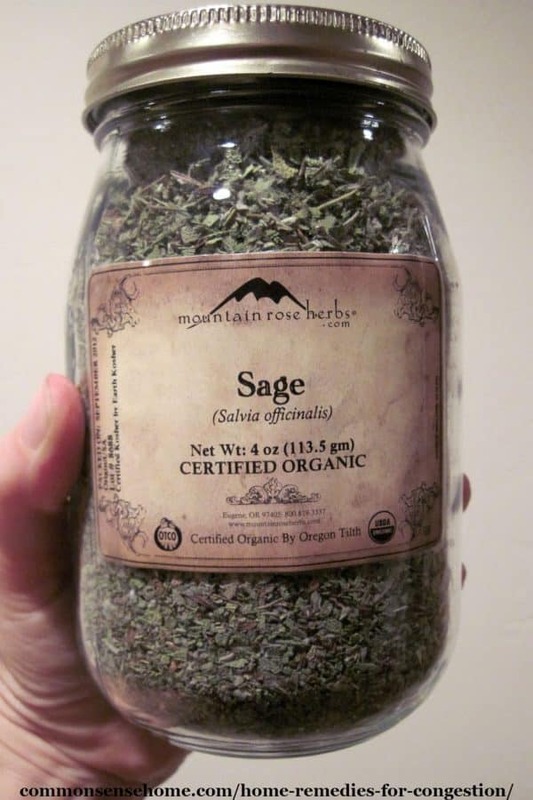 Bulk Herb Store has a good supply of herbs, tea supplies, salve making kits and supplies, etc. Yep. I have them on my affiliated list. They have better prices on some items, but less of a variety of items than MRH does. This is great. Thank you for this list. I have many of these things on hand and my daughter is very congested. I hope your daughter makes a quick recovery. Isn’t milk weed poisonous? I would check into this before eating milkweed. Milkweed is not poisonous, at least, not common milkweed (Asclepias syriaca). See https://commonsensehome.com/weekly-weeder-10-common-milkweed/ for more information. Tea tree is another great essential oil to add to steaming water for inhalation… a lot of sinus congestions and infections are due to a combination of viruses, bacteria and/or fungi, and tea tree covers it all. Great local remedy for chronic sinusitis as well. Thanks for all the great info, I really enjoy your blog and Facebook page. For the record, if you use DoTerra oils, you can use almost all of their oils topically, as well as internally and aromatically. I am a doTERRA EO user, but even with their oils I have found I need to be very careful to dilute them and use them minimally, as I am very chemically sensitive. The hot sauce irritated my nasal passages. it opened them but they burned afterwards….and burned my esophagus. the apple cider worked.. I also did it with white vinegar too. Going without milk, sugar definitely worked! Drinking salty chicken broth was a good. I am needing help with a special needs child with a feeding tube. My hubby brought home a head cold that is hitting my son hard. We have done the vapor rub, but we can’t exactly food liquids down his throat without him choking. I am going to make the vapor disks and try the steam shower. Poor baby is miserable. Poor baby! I hope the steam helps. Lots of different herbal teas have helped clear up my sinuses – Peppermint, Raspberry, Lemon Balm, Rooibos, Honeybush, are just a few. Take 2 tea bags in a cup or large glass and drink 3X a day. Let the tea bags sit in the water for about 20 minutes. You should be clear in no time! Keep in mind, at the beginning you could have a detox effect and feel worse before you get better while the tea brings stuff out. If you feel a cold brewing… another remedy that is good.. is high doses of vitamin c. .. get the solaray brand the 1,000 mg capsules…. if and adult. Or kids that are adult sized .. you want to take 10,000mg in the morning and the same. Before bed … the next day you will feel the difference if it clearing up… continue till the cold is gone… if its a child go with 5,000 mg same way.. if toddler or baby smaller amts….. vitamin c has powerful qualities. But you must get quality as well.. not cheap crap they sell.. I have always suffered with sinus issues, (dad was a heavy smoker and for 18 years I was the second-hand smokee), until I began eating healthier and switching out cleaning supplies, cosmetics and OTC/Rx’s for homemade and organic. and a salt/vinegar hot gargle. I start with the gargle, and do it two times, using a vocal scale to get all the areas of the throat. Then use the neti pot on both sides, switch back to the gargle, and do this until all the neti pot solution is gone. Yes, I do. I also spit lots of gunk after gargling, as well. That is the whole point, to rid the body of all that mucous. Hot tea with lemon and honey has been a congestion fighting favorite of mine for years. Momma always stocked Lipton tea bags, but now I buy my black, green and oolong in bulk, and sometimes enjoy some tulsi (holy basil) tea blends as well. Lemon is a great mucus clearer on it’s own, and can provide extra vitamin C, and honey is naturally antibacterial, so do include them in your brew. Question about mullein: Which mullein (botanical name would be helpful! ( is best to harvest for making tea? there are many kinds. Do i use the leaves only flowers only, both leaves and flowers? Thank you in advance. Generally when the term mullein is used by herbalists, it refers to great mullein (also known as common mullein) Verbascum thapsus. Any of the tall, yellow flowered mulleins can be used, as well as white mullein, Verbascum album. Either leaves or flowers can be used, or both. If you use the leaves, make sure to strain the brew well to avoid drinking the fine hairs. I’m on day number three of an upper respiratory infection. Normally on this day I would be fighting bronchitis. Now I blew my own peppermint tea with rosemary thyme basil and Sage seat for 10 minutes and a tablespoon of raw honey. Also used Zicam honey lemon spray and a saline nasal spray. Chicken noodle soup for one meal, chow mein for another, abeucslyptus bath & I feel on the upswing. Still praying for complete recovery. I hope you’re on the mend soon. Eat light and stay hydrated. A live in Wisconsin, cheese capitol of the US. I feel your pain. This is great! I’m in the military and getting colds really interferes with work, as it does for any job. However I can’t take sick days unless the military doc gives permission. LOL. So when I feel a cold/sickness of any kind I grab my ACV and start drinking it in every glass of water I have! I actually enjoy the taste and have found it tastes pretty good mixed with lemon sparkling water. I also found eating crystallized ginger helps me personally, but that could be my sweet tooth talking! My eldest loves crystallized ginger, too. Need ba ba mail recipe for getting rid of chest congestion.I lost my copy. It contained cinnamon bark and ginger with several other things.Can you help me? thank you. I’m not sure what word was supposed to come up instead of “ba ba mail”, but I do have a cold and cough care recipe post on the site that uses those ingredients at https://commonsensehome.com/cold-and-cough-care/ . I will never forget these four teas, because the effect was so dramatic on my sinus congestion and face pain. This was 45 years ago! I steeped mullein, coltsfoot, horehound and eucalyptus teas in a pot. Put a towel over my head and breathed in the vapors. Then strained some of the tea and drank a cup ( tasted awful!!). Completely effective. Interesting article. I’ve had sinus issues for years, aggravated by home heating during the cold months. Every fall I make a super big batch of vegan chilli and freeze portions. Then I’ll add as much chilli powder to mine as I can handle. The heat from the spice does seem to help. My other favorite is vegetarian sushi, with wasabi. It really seems to clear my sinuses, at least temporarily. Pine needle tea seems to help relieve my sinus problems as it hrlps thin the mucus. Also taking 3-4 drops of diluted oregano oil per day seems to help get over it faster. Thyme has been effective for me in two ways: put one or two tablespoons of ordinary kitchen thyme in a bowl that’s large enough to accommodate the lower half of your face and that won’t conduct heat (so you don’t get burned). Pour two cups or so of boiling water over the thyme, lower your face as close as you can stand the heat, and breathe as normally as you can. When the mixture cools to the point of not steaming, it can be strained and drunk as tea. It’s strong and bitter, so you may want to use some honey to make the medicine go down. Thanks for sharing your experience, Stephanie. This is a great list. I have done these things most of my life and I concur that they are effective. I will add Saline Nasal Rinses. Thank you for sharing accurate and very useful information! I also use acupressure to help my stuffy nose. It works if my nose isn’t runny and I just can’t breathe through it. It sounds weird, but I put my right thumb in my mouth and use my right index and middle finger to put pressure on my forehead. Fingers pressing the middle where my eyebrows begin while using my thumb to put pressure on the roof of my mouth. I also put pressure in the middle between my eyebrows alternating between there and the eyebrow spots. Do it for 15 seconds or more at a time for around 5 minutes. It should start to drain soon. Any note on what not to use if you are pregnant? I know some teas shouldn’t be used. I can’t take anything for decongestion OTC so I’m suffering through with saline nasal spray at the moment. #1, 2, #3 with peppermint steam, #5, #6, #8, #9 should all be fine. I grow and brew my own stinging nettle tea. I feel it is responsible for me not getting sick when the rest of the family all had the flu. Stinging nettles is high in antioxidants. The tomato tea sounds like a winner for me, after plain old chicken noodle soup made with home made bone broth! I like to keep a pot on the stove with cinnamon, cloves, allspice and bay leaf simmering on low, adds some humidity to the winter air, as well as diffusing all the goodness of the spices (smells good too). I know Instant Pots and similar products are all the rage right now, but I truly enjoy the wonderful smells that come from cooking on the stove top. Mo matter if it’s savory or sweet, having those aromas drifting through the house is part of the whole experience of cooking. For preventing and treating sinus infections we use the neti pot with salt and also empty a probiotic capsule in and mix. One of my children used to need an antibiotic several times per year for sinus infections until we started doing this. I have been drinking the tomatoe tea for 4 days now…..it was not a recipe I would normally try but I am glad I did. 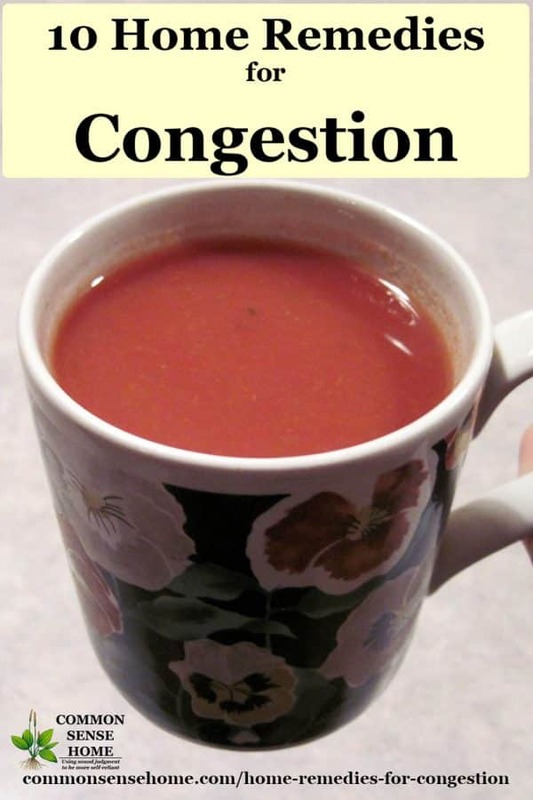 It is really helping with congestion. And I was surprised how good it tastes! It also helps warm the body in all this cold weather. I’m glad to hear that you’re getting some relief. I like tomato juice, so it’s an easy remedy for me to use.